Mazda MX-5 (2005-2015) - Car Reliability Index | Reliability Index | How reliable is your car? Summer fun comes no more reliable or enjoyable than with a Mazda MX-5, the cult sportster that was first seen in 1989. One of the most affordable driver's cars around, the MX-5 has become a true legend in its own lifetime, and for many good reasons. Firstly, it's in a class of its own thanks to all rival two-seater sportscars being much more costly. The MX-5 is also amazingly reliable while offering a truly great drive. It's also far more usable than you might think plus it's as reliable as you'd expect from this Japanese manufacturer. It's a drivers dream too; the brakes, steering, engine, gearbox and suspension all work in perfect harmony to make every journey a delight. Even better, there's a thriving social scene around the MX-5, so it really is the perfect sportscar. 8/05 The MX-5 Mk3 arrives with 1.8 or 2.0 petrol engines. 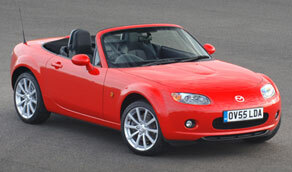 10/06 An MX-5 coupe-cabriolet becomes available for the first time ever. The plastic roof cuts weight; the car is mechanically identical to the regular convertible, aside from revised suspension settings. 1/12 Another facelift brings optional sat-nav, a restyled nose and recalibrated brakes. The Coupe-Roadster's roof isn't immune from leaks, although they're rare. Hose the car down and see if any water gets in. The gearbox can be noisy once warmed up; listen for rumbling. This is normal though, with gearboxes appearing to be tough. Make sure the cloth roof isn't damaged, as replacing it is costly. Check the frame, fabric and rear window for damage. Ensure the coolant in the radiator is up to strength; a special fluid is needed and it's available in 5-litre bottles only. The alloy wheels corrode, so look for bubbling of the lacquer. Many sets have been replaced under warranty. Check that the brake discs haven't warped from track day abuse; feel for juddering under braking. Upgrades to the suspension, exhaust and engine are common; ask who has worked on the car as not everyone knows what they're doing.